For a modern with classic appeal, the Brooke Collection features ezyme washed canvas in a geometric print in shades of indigo, caramel, and pear. Trimmed in coffee brown leather and antique brass hardware. Lined in solid caramel cotton fabric. 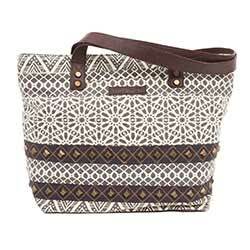 Brooke Market Tote, part of the Bella Taylor line by VHC Brands. 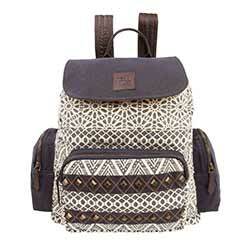 Brooke Rucksack, part of the Bella Taylor line by VHC Brands. Brooke Shoulder Tote, part of the Bella Taylor line by VHC Brands. 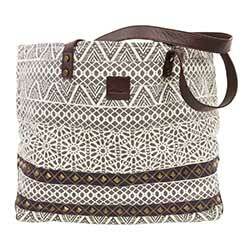 Brooke Wanderlust Tote, part of the Bella Taylor line by VHC Brands. 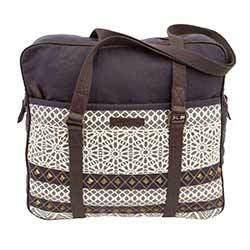 Brooke Weekender, part of the Bella Taylor line by VHC Brands. 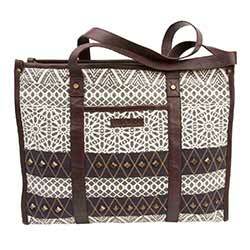 Brooke Wide Tote, part of the Bella Taylor line by VHC Brands.